Half way through our fourth week. We’ve now covered 508 miles – just over half way. 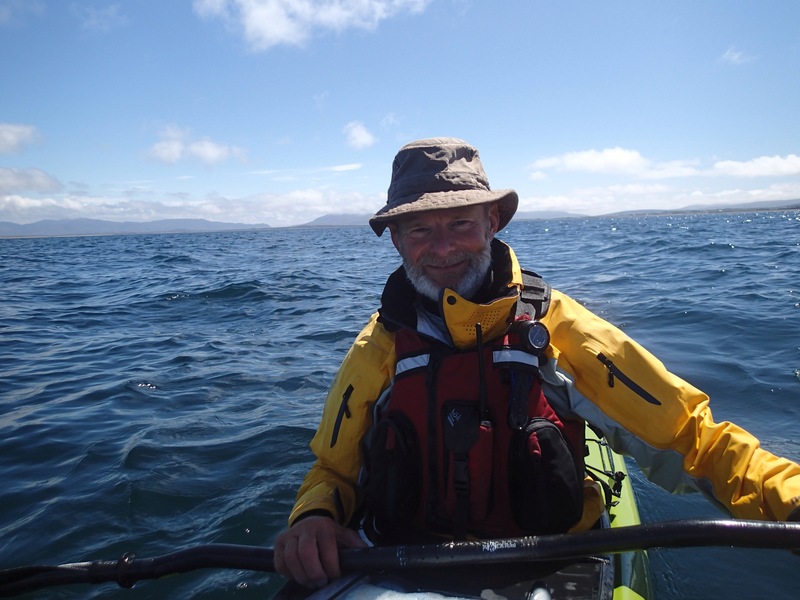 The last couple of days we have been heading east into the Bay of Donegal to position ourselves to make the crossing to Malin Beg. It is a spectacular coast but also very committed. There are few places to get out and the winds get compressed and accelerate over the mountains and hills and down through gulleys. Yeterday we left Knocknalina with a southeasterly F5. 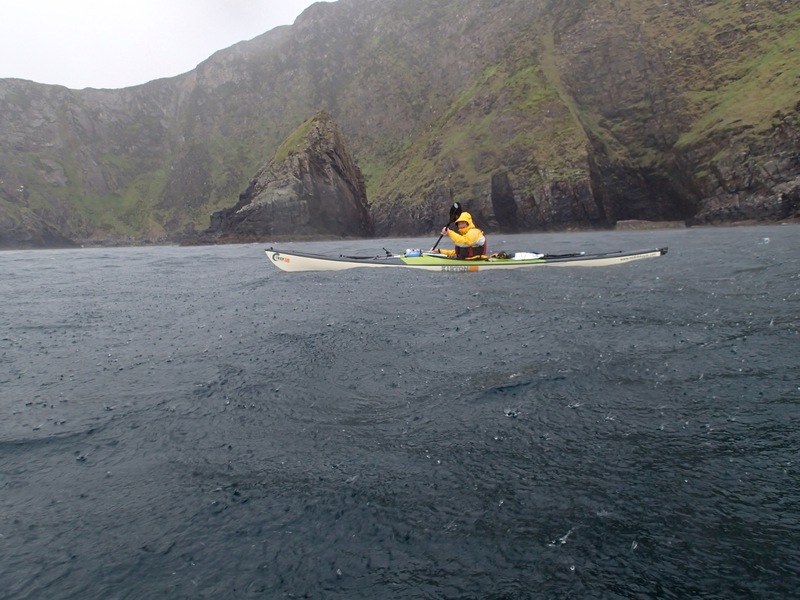 We made good progress until we got into Donegal Bay proper. 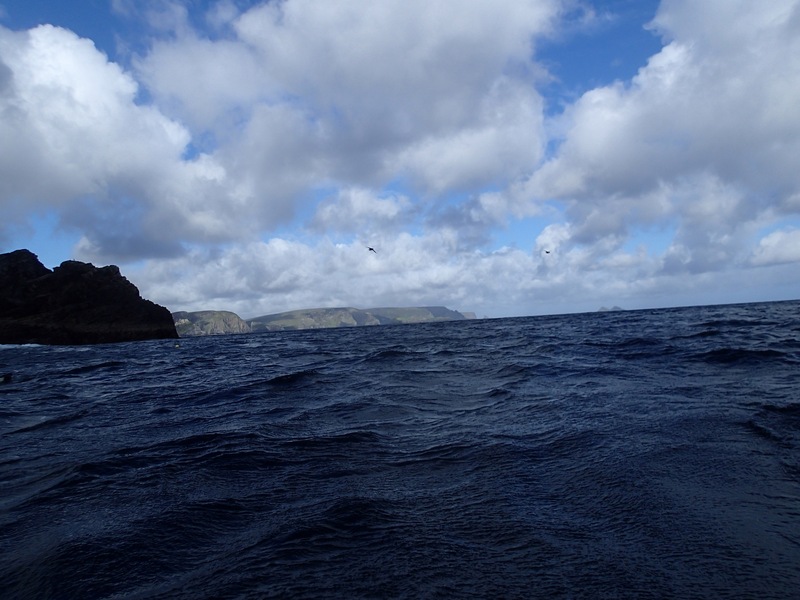 We were facing F8 gusts frequently and for prolonged periods which attempted to rip the paddles from our hands. But we were still making headway, albeit only around 2.5 to 3 miles an hour. Then came the most torrential rain that was so hard it almost hurt the hands. We had made 13 miles but progress was getting tougher. Porturlin was just a mile further on and offered an option to get off and reassess. If we pushed on we were committing to another 15 miles of potentially worsening conditions. We opted for Porturlin. As we made our way to the back of the harbour and a beach landing we ate some food and discussed options. The wind seemed to be strengthening and so whilst we felt we could cope with the conditions we also felt why slog out 15 miles in 6 hours when we could probably so it in 3 tomorrow. We stayed in the kayaks and waited for the rain to stop. It was the best way to stay warm. In fact we both dosed off. Finally the rain did stop and we landed and pitched the tents amongst the sheep and got some hot food on. It is strange how very quickly you become comfortable with a new camping site. What at first can look quite inhospitable becomes homely once you are warm and inside your tent. In fact I’m writing this inside my tent on a harbour wall while the world goes by outside. Today the southeasterly turned into a southwesterly so although it was a similar strength as yesterday, at least it would give us a bit of a push. For most of today, the rain stayed away and the sun lit up the extraordinary cliffs. We even had time to explore a couple of caves and gulleys – certainly the largest Geoff and I have ever seen. This is definitely an area to come back and explore more. We have seen very few other craft up the west coast, those that we do see are lobster or line fishermen. In some ways it adds to the sense of this being an extreme stretch of coastline. 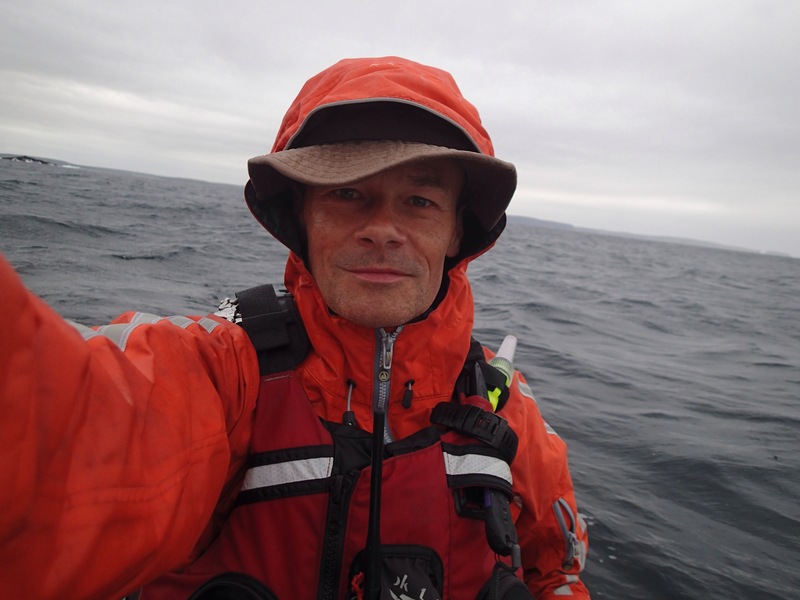 One thing that has struck both of us though is the greeting we get from fishermen as we paddle by. Not just a nod through a cabin window, most make a point of leaving their cabins walking to the stern and giving us a hearty wave. This afternoon we walked into Ballycastle to Mary’s Cottage Kitchen – soup, toasted sarnie, bread and butter pudding, cheese cake and around a gallon of tea. Perfect stop. Thank you to Kim and David for your very generous donation! The total for our charities is climbing nicely. 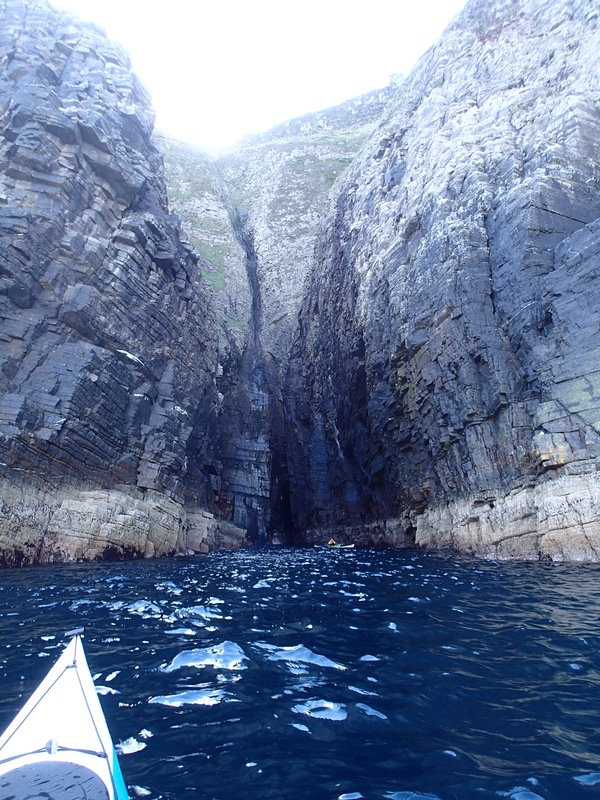 The photos can’t do the scenary justice but do check for Geoff at the bottom of the cliffs – you’ll get a sense of scale. Another great day on and off the water. Last night was bonfire night in Ireland which is held on the eve of the birth date of St John the Baptist. No fireworks on Clare Island but the world’s biggest bonfire had been built on the beach about 300m from our tents. When Geoff and I headed off to bed around 10.00 pm the party hadn’t started. We thought perhaps we had got the wrong night and were quietly relieved that we might actually get some sleep. What we hadn’t reckoned on was the party starting at 3am. Our tents now formed the centre of the car park and what must have been all of the island’s young people arrived on cue. We kissed goodbye to any sleep…. Lack of sleep didn’t seem to affect us today though. 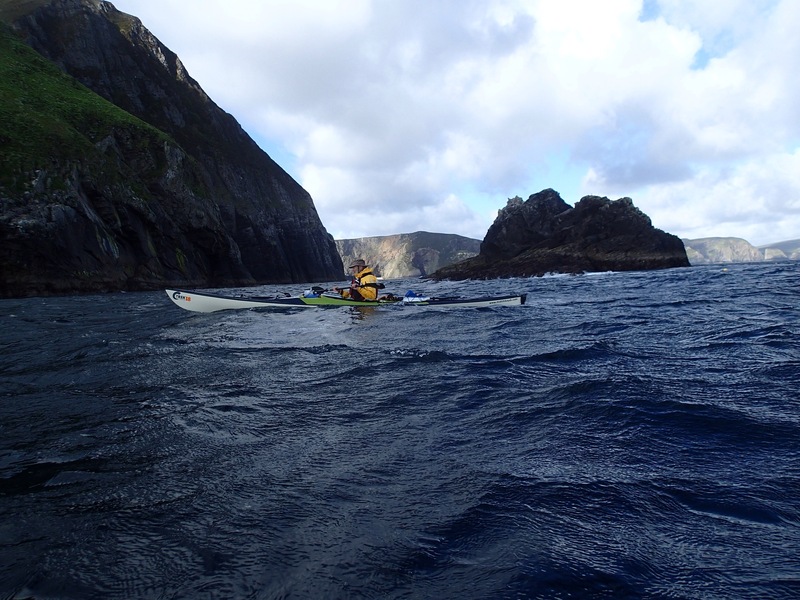 We timed our launch to pick up the north going flood tide through Achill Sound and together with a southerly wind we made between 5 and 6 miles and hour for the first 10 miles. The persistent rain and mist didn’t take the gloss off a perfect start. At Achill Bridge the tides meet so that north of the bridge the ebb tide continues north. That means you can get a good tidal push for 14 miles or so – free miles!!! We had timed it just right. We paddled under the bridge and pulled over on a slip way as we had spotted a supermarket. We must have looked a right pair as we walked in. We got a few funny looks and friendly comments. A coffee, sausage roll, chicken and mushroom pie and a breadcrumb fillet of chicken later and we were back on the water to pick up the ebb tide. As the tide changed so too did the weather. 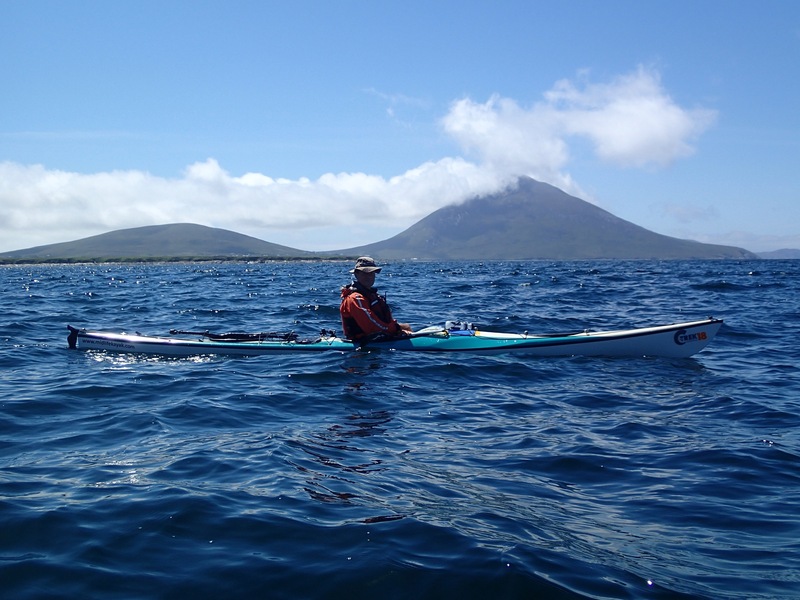 The rain stopped and mist and cloud lifted leaving us to paddle in glorious sunshine and allowing us to enjoy the incredible mountainous backdrop on Achill Island. 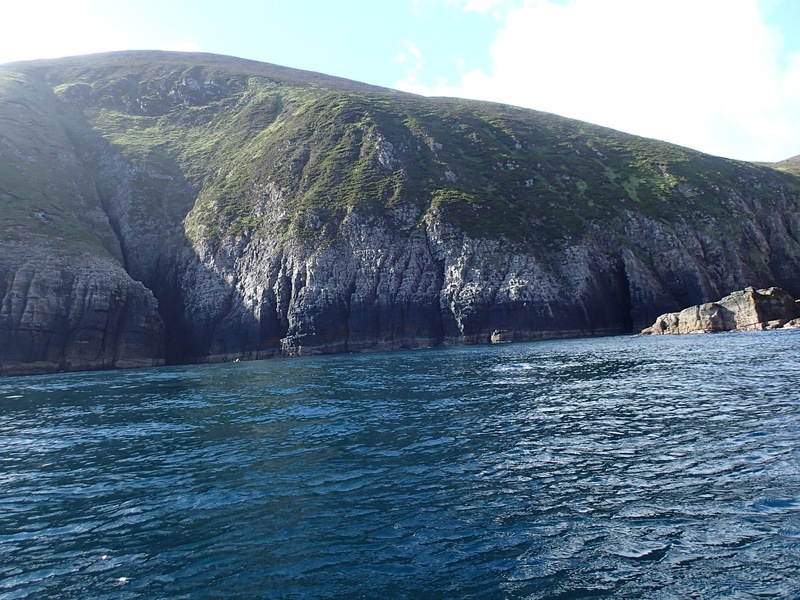 18 miles down now and we were out the other side of sound leaving Achill Island behind. 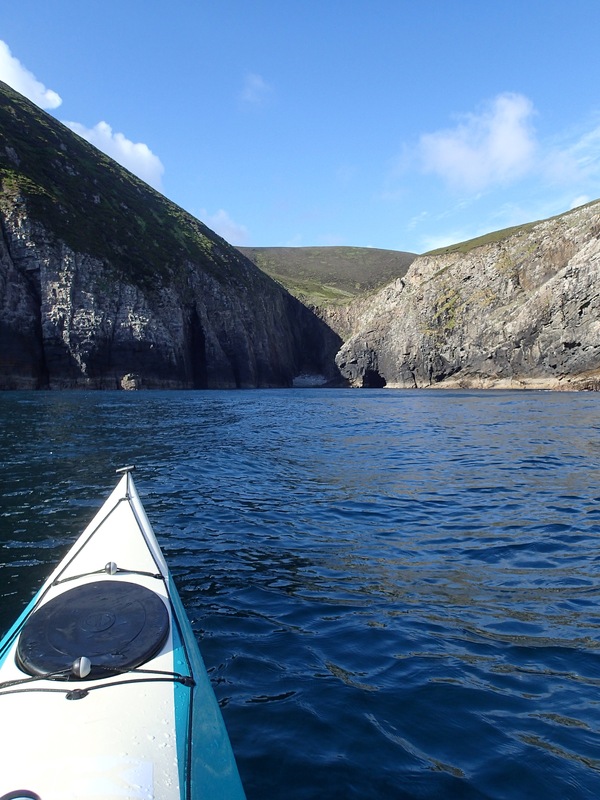 Another 14 to go before we met the channel that joins Blacksod Bay with Broadhaven Bay. Incidentally, a weather report from Blacksod lighthouse on 3rd June 1944, caused Eisenhower to delay the D Day landings by a day and potentially averted a complete disaster. 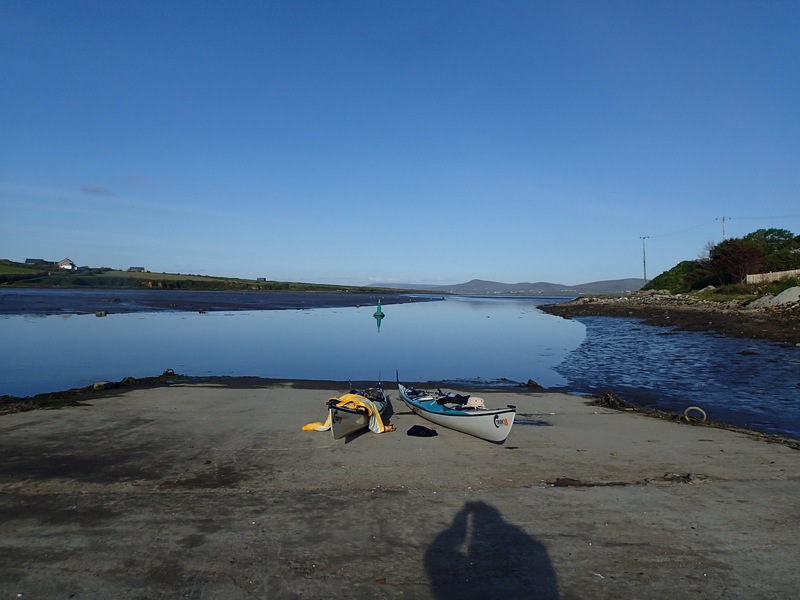 By the time we arrived at the channel at Belmullet it was low water, but there was still just enough for us to paddle the few hundred yards through. We were feeling good and the sun was still shining so we decided to stop for fish and chips and then push on a few more miles. So here we are at Broadhaven,poised to enter Donegal Bay tomorrow. We’re camped on an old slipway beneath a trawler feeling satisfied with another 36 miles under our belts. Big thank you to Freya, Becky, Daz, Christine, Deborah and Joanna for your donations. You guys are amazing and so generous!